First, a caveat: I know I haven't posted much aside from the financial comics for several weeks. I've been working on a number of other illustration projects and jobs, but many of them can't be posted right now for plethora of reasons. I promise that I'll post the other projects as soon as I'm able to. The World Economic Forum is taking place this week in Davos, Switzerland. If you didn't get your invite, don't worry. I didn't either. I mean, come on. I'm "Committed to Improving the State of the World". What else do you want? Anyway, while it stung a bit to not be included, I've been consoling myself that I wouldn't have much to talk about with Jamie Dimon and we'd end up staring at each other awkwardly. Me to Jamie Dimon: "Uh...hey, man. Nice suit. Where'd you get it?" Jamie Dimon: "Thanks. I had it tailored at Armani. Nice...uh...sweatpants. Were they tailored?" Me: "No, I think I bought them at a gas station." Jamie: "Oh, well they fit really well." So instead of going, I got to draw a picture of the festivities, which I'm sure I enjoyed far more than I would have enjoyed attending. 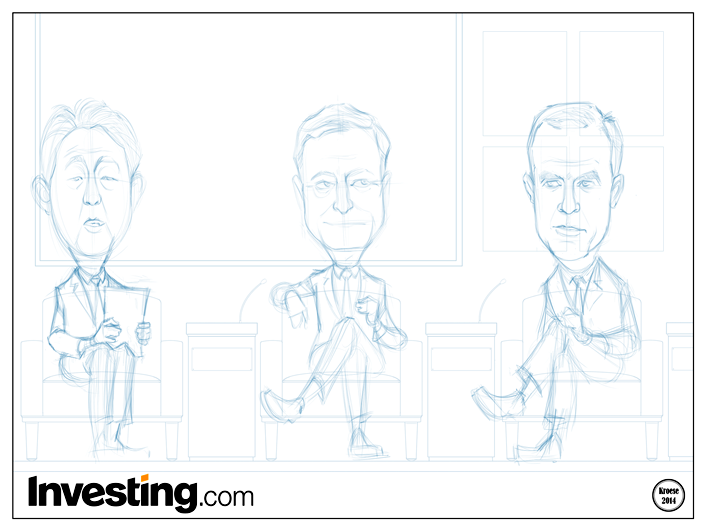 I was asked by the crew at Investing.com to draw Japanese Prime Minister Shinzo Abe, European Central Bank head Mario Draghi, and Bank of England Governor Mark Carney on stage at the World Economic Forum. I was also asked to include a big screen behind them with a graph showing rising income inequality. The graph illustrates the gap between the super rich and the super poor, so in a way I did end up making it to the WEF in spirit. I think, in terms of the illustration, this is the best financial comic I've done so far. And there have been over 60. I think the faces are great. The likenesses and expressions are well-drawn. 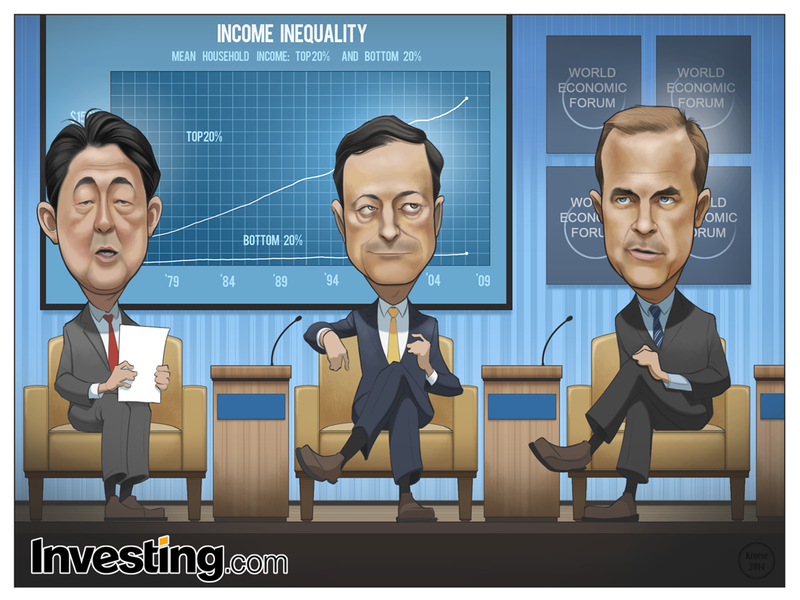 My favorite is Draghi. I love drawing Draghi. His face has a lot of character. I've decided he looks a little like a cross between Humphrey Bogart and Peter Lorre. I also like the colors a lot. I think the warm yellows of the skin tones, chairs and podiums are a nice contrast against the blues in the background. Now, if you're reading my blog for the first time, me extolling the virtues of my own work is going to come off as pretty obnoxious. Trust me, this is rarely my opinion of my own work. Just read some of the posts about previous financial comics. But this one came out great and I'm just going to enjoy the fact that I'm satisfied with it. That having been said: Abe's body pose is a little awkward, their bodies should have cast shadows on the chairs in which they're sitting, and Mark Carney is a little bigger than the other two. Still, those are the biggest aspersions I can cast, so no biggie. Overall, I'd give this one a rating nine world leaders out of ten.